★★★★☆ Good quality at a fair price. Very comfortable. The only negative thing is that there isn't a secondary power source so you can only pump it up when you connect the power coard to an outlet. This could be problematic when camping and power sources are limit. I would've been very happy if you could install batteries to power the air pump. Other than that, this mattress is great. It comes with a couple repair patches and travel bag. An extended queen size mattress with a built in air pump for less that $40, this value is hard to beat. ★★★☆☆ First time I used bed it was great. I woke up without any of the back problems or circulation issues I was experiencing on my more basic air mattress. 2 weeks into use, the mattress began deflating on me, leaving me to awaken folded up with my rear touching the ground, unable to lay towards one side without falling off. Though the mattress says it can take up to 600lbs, I wouldn't recommend to someone in the 300 range like myself. ★★★★★ This air mattress is exactly as described. 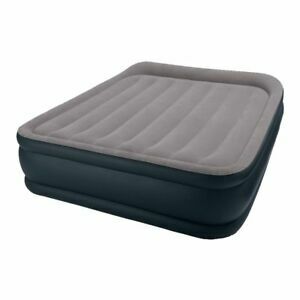 The built-in pump is quiet, and quickly and efficiently inflates the mattress to the desired level of firmness. The mattress held the air very well for guests that were using it for an extended period of time. Queen size easily supports and is comfortable for 2 adults, or multiple children. Quick, comfortable and priced right! What more could you ask for? ★★★★★ Bought this queen size air mattress because Hurricane Irma caused a leak on our ceiling and ruined our mattress, considering the heavy traffic and delays in everything this mattress arrived in 4 days. It's comfortable, inflates in 4 minutes, the built in pillow is comfortable. I'm extremely happy with this bed and extremely happy I don't have to sleep on the couch or hard floor anymore.